Leanne Moussa shows Councillor Mathieu Fleury how the heritage structure will be maintained in the proposed project. Allsaints Event Space is in the news again. 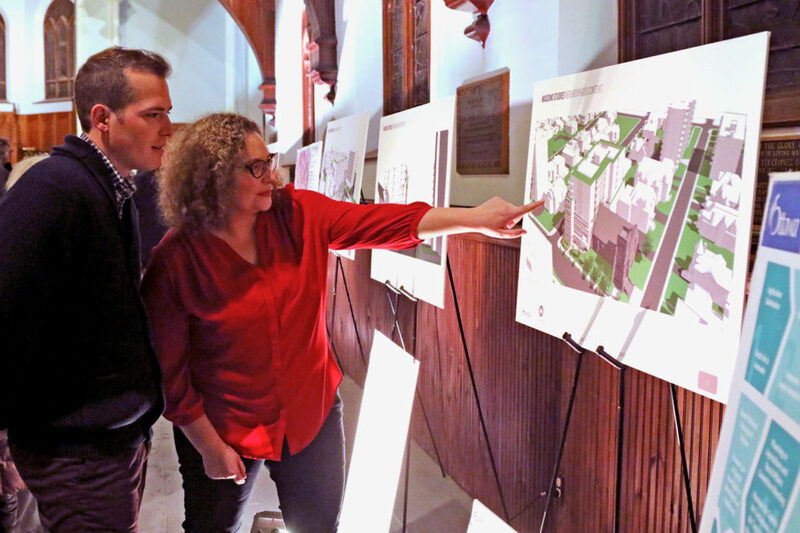 Leanne Moussa held a community consultation in January to reveal the next step in her plans to turn allsaints into a commercial success and a community asset. About 60 people attended her latest information session at the former church. This included Kersten Nitsche, city planner, Lloyd Phillips, allsaints planner, and Muna Awatta, allsaints transportation planner. Councillor Mathieu Fleury made the introductions. Informed by many charts that were arranged against one of the walls of the former sanctuary, guests were able to look at mock ups of the proposed building. There also were charts on the planning process, current zoning requirements vs. proposed zoning, preliminary estimates of suite sizes and number, parking study, and planning steps. Maintain some form of public space. Welcome all members of the community (not just gentrification). Preserve the history of the building. As they began to see the potential of the church, Leanne spoke to potential investors including community members as well as members of her family who were business people in Alberta. They bid for the property and the diocese agreed to sell it and act as mortgage holders in 2015. Their first open house was in 2016 and the investors responded to many suggestions by neighbours, Action Sandy Hill and Heritage Ottawa. Another community session was held in April to reveal the changes. The plan was then submitted for review and discussion by City Planning in May, 2017. Countering opposition, there were also several people who spoke in favour, a rather unusual experience for a consultation of this kind in Sandy Hill. Twice during the presentation, many applauded an audience member who made a complementary point. Chad Rollins, Action Sandy Hill’s president, spoke encouragingly about the project, too. Veronica Asgary-Eden, one of the local investors spoke with great conviction about the project, telling the audience that her young family is very keen to support a project that, in her opinion, is a great benefit to the community. Another person pointed out that 90 churches in Toronto have been bought and condos have been built or are in the process of building beside or attached to the churches; at least one condo on High Park Avenue has been built on top of the original church. I think his point was that this is a phenomenon that is becoming very common and we can expect it to continue. Implicitly, we don’t need to demolish these churches; we can repurpose them to good advantage and keep our heritage. The team is still absorbing the information and working on how best to adapt in areas where they are able to make changes. We are likely to see changes to the rooftop patio and the setback along the west side of the building. With the zoning change, the possibility of allsaints being made into a shelter or rooming house will disappear. Leanne says that many of the other comments will be addressed in the next phase—the actual design of the building. “Our goal is to create a space where we can host book launches, speakers, and artists … to be part of an area that is already an important civil society hub in the Nation’s Capital. The new allsaints should complement the NGOs on the street, and be in keeping with Prime Ministers’ Row. It should also create a very positive dynamic with the University.” It will also include more community consultations during the design phase. The rezoning proposal and official plan amendment is expected to go to planning committee February 27, 2018.